Controlled Environment Agriculture – Production of Specialty Crops Providing Human Health Benefits through Hydroponics provides useful information on agricultural technology management that enables the grower to manipulate a crop’s environment to the desired conditions. Specialty/functional foods can be produced through simple modification of nutritional composition and environmental controls. Management of chemical composition of hydroponic culture solution and physical modification of growing environments can enhance the performance of agricultural produce. Moreover, development and supplementation of special dietary components provides several human health benefits beyond basic nutrition. This book mainly include reviews and original research on the enchantment of growth and yield crop plants along with consistent production of secondary metabolites and antioxidants under controlled environments. Light quality mediated changes in nutritional quality and anti-oxidative properties of crop plants are also described. The final chapter reviews the current sensory perception of hydroponically grown fruits and vegetables compared to soil cultivation. The aim of this book is to represent a new way of thinking about sustainable production of specialty/functional foods using specialized culture techniques and demand oriented distribution. 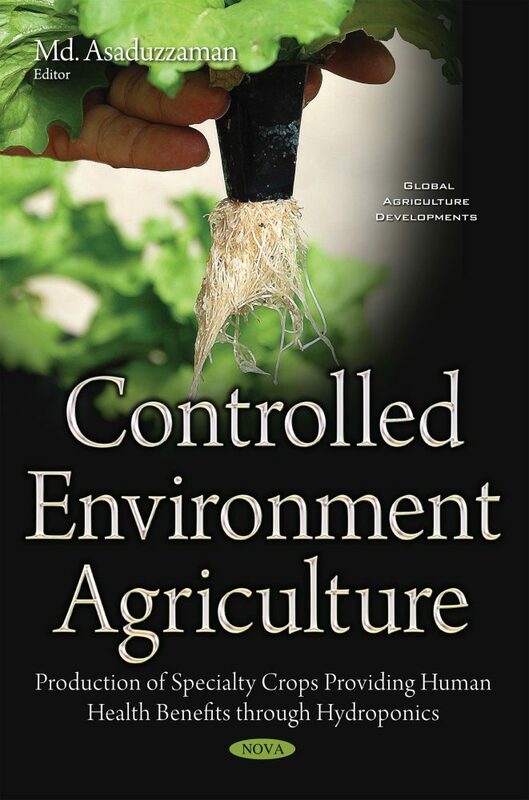 Interesting research on controlled environment agriculture from around the world are brought together in this book to produce a valuable resource for teachers, researchers, commercial growers and advanced students of plant biological science. Do Nitrogen Level and Genotype with Different Leaf Color Affect Spectral Absorbance (330 nm-800 nm) and Nutritional Quality of Hydroponic Lettuce? ·	In the places where successful crop production is limited by environmental extremes such as arid land, coastal area, submerged area etc. this specialized culture techniques can be used successfully to supply fresh and nutritious vegetables. ·	In developing countries low-tech CEA systems can be used to provide intensive food production using limited acreage and resources. ·	Fortification of mineral nutrients and production of specialty dietary components in the agricultural produce. Useful to the super market/ expensive restaurant owners as they can supply readily a variety of fresh vegetables to the customers.